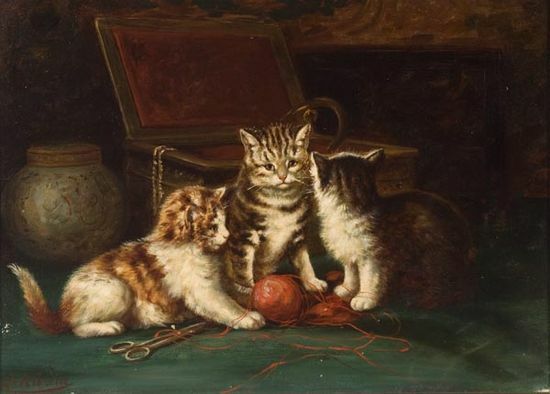 Over a 100 artists in the 19th century and through the turn of the 20th century chose to capture cats in art not only on canvas but in a myriad of advertisements, greeting cards and sculptures. 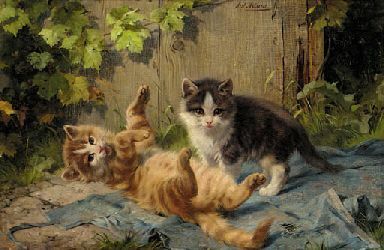 For the first time in history the cat would find itself as the primary subject of art with such cat loving artists as the prolific Henriette Ronner-Knip, Théophile Alexandre Steinlen and Louis Wain choosing to almost exclusively paint their feline friends, while the well known photographer, Harry Pointer photographed them in strange anthropomorphic poses. 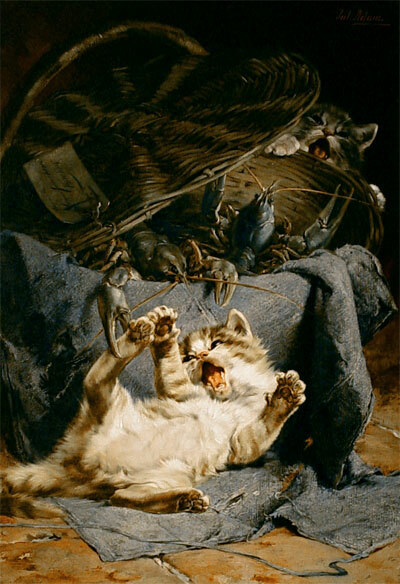 Cats would become human in dresses, bows and ribbons, wearing pants, and even fighting wars. 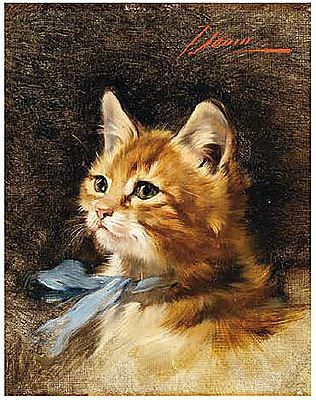 Wain and Pointer’s anthropomorphic representations brought the cat closer to the human heart by depicting it as human. 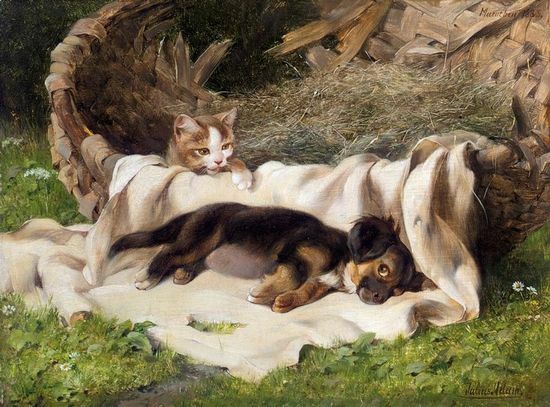 The cat’s natural viciousness was gone, instead it sat primly clothed in dresses sipping tea, a living doll, an eternal child. This page is a work in progress, so please check back regularly for updates or subscribe and receive them automatically. 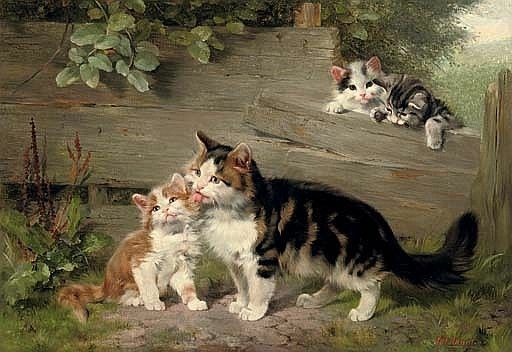 In order of the artist’s last name. 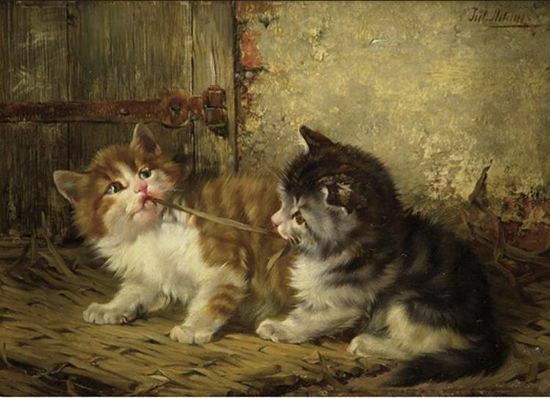 Julius Adam II (1852-1913, German) For all paintings by the artist click here. Cats by a Fish Bowl and many, many more. 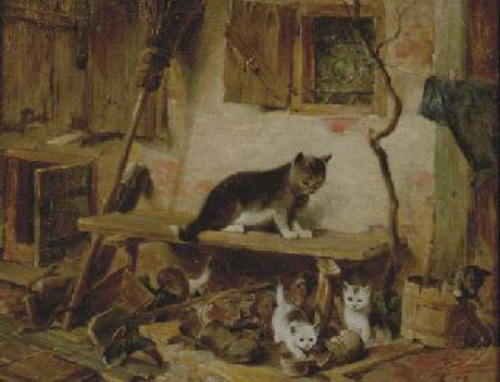 Weiße Perserkatze und Junges beobachten einen Marienkäfer. 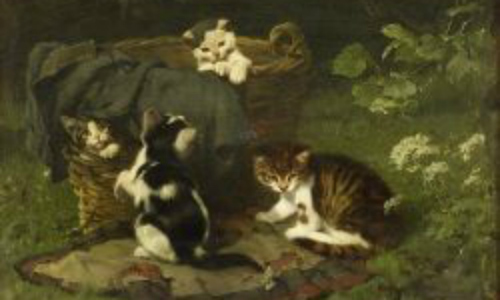 Want to know more about the cat in in art and history? Then Revered and Reviled is the book for you. Available now on Amazon. Hello, wonderful listing! I have been looking for something like this for a long time! 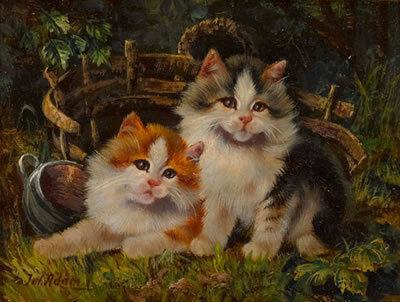 I am constantly searching for new 19th century artists to add to my collection, this will help immensely! I would like to recommend a number of names. 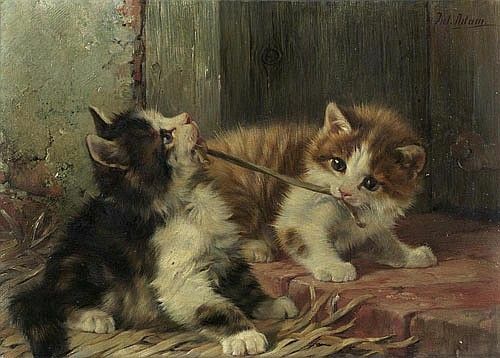 A few may be a bit too modern for you, but they are some of my favorites from my personal collection nonetheless… Josef Heimrel (Austrian, 1867-1918), Jules Gustave LeRoy (French, disputed birth dates of either 1833-1865 or 1856-1921, Christie’s favors the latter), Licinio Barzanti (Italian, 1857-1944… Very under appreciated, he produced stunning works), Alfred Arthur Brunel de Neuville (French, 1851-1941), Carl Kahler (Austrian, 1855-1906), August Laux (German, 1847-1921), Sophie Sperlich (German, 1863-1906), Guillaume Fouace (French, 1837-1895), Hermann Capellmann (German, 1886-1967), Théophile Alexandre Steinlen (Swiss-French, 1859-1923), John Fitz Marshall (British, 1859-1932), Hugh Collins (British, ??? ?-1932), Emile Falentin Cardinal (French, 1883-1958), Benno Kögl (German, 1892-1969), Beno Boleradszky (Hungarian, 1885-1956 or 1957), Percy Sanborn (American, 1849-1929), Ben Maile (British, 1922-still alive… Prominent military and marine artist collected by the Royal family who did cat watercolors before making it big). 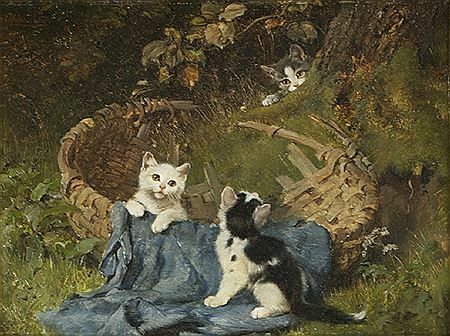 Finally, perhaps add Carl Reichert’s highly favored pseudonym, Julius Hartung, typically signed J. Hartung). Thanks so much for your suggestions. Some of the artists are listed under the 20th century. But I have a long, long way to go! 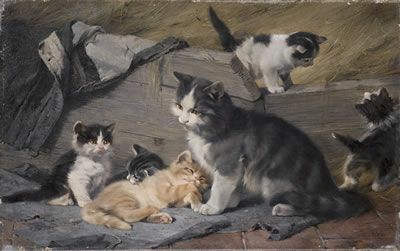 a note on LeRoy: Jules LeRoy was a landscape painter, 1833-1865; Jules Gustave LeRoy was the cat painter, 1856-1921, often mixed up in auction listings. Thanks so much for your comments. I’m trying to add these artists too. There are so many!! 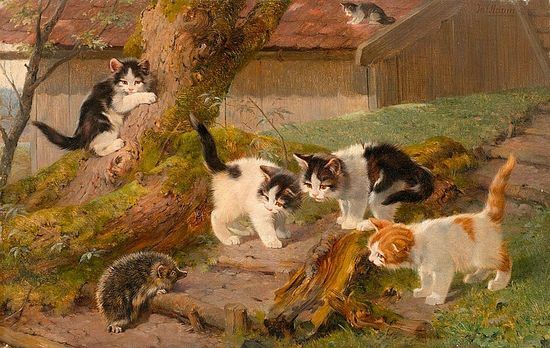 🙂 If you subscribe to our weekly emailings, a new cat artist is presented almost every week.